Security software, proxy, firewall or router settings may block the activation from being completed automatically. To activate manually send us the information requested in the asterisks below by clicking the "Start a conversation" using this link. 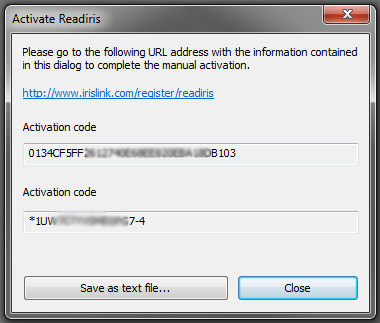 Copy the Serial number/ Activation code (from your email order confirmation). Click Next and the software should activate automatically. If it does not work then send us this information. b) Click on the Manual Operation button. 2. Click on the Save as text file... button at the bottom of the next window and attach that file to a ticket.